Yes, we're reprinting Steam in Northern Ontario! For years, we’ve been fielding inquiries from readers, especially newer ones, about getting a copy of this volume we first published in 2006. Only once in 20 years have we reprinted any titles, that being Steam at Allandale (almost nine years after release). We’re breaking the drought again with Steam in Northern Ontario. A word about the reprint: aside from the occasional typographical correction, the content and layout of Steam in Northern Ontario will match the first edition of 2006. HOWEVER, the book will be printed on a state-of-the-art press that Ampersand Printing did not have in 2006. We’ll be striving for even greater excellence in photo reproduction. $69.95 CAD SHIPPED TO CANADA (click button multiple times if ordering more than one copy). Shipping charges and GST will be added. Indicate for whom you would like it signed, if applicable. $69.95 USD SHIPPED TO USA (click button multiple times if ordering more than one copy). Shipping charges will be added. Indicate for whom you would like it signed, if applicable. Please send us an email and we will invoice you with a shipping charges. Be sure to also check out Steam Scenes of Northern Ontario. That is a 48-page softcover supplement featuring 87 photographs not included in the hardcover volume for space reasons. Steam in Northern Ontario will be printed and bound in Canada! 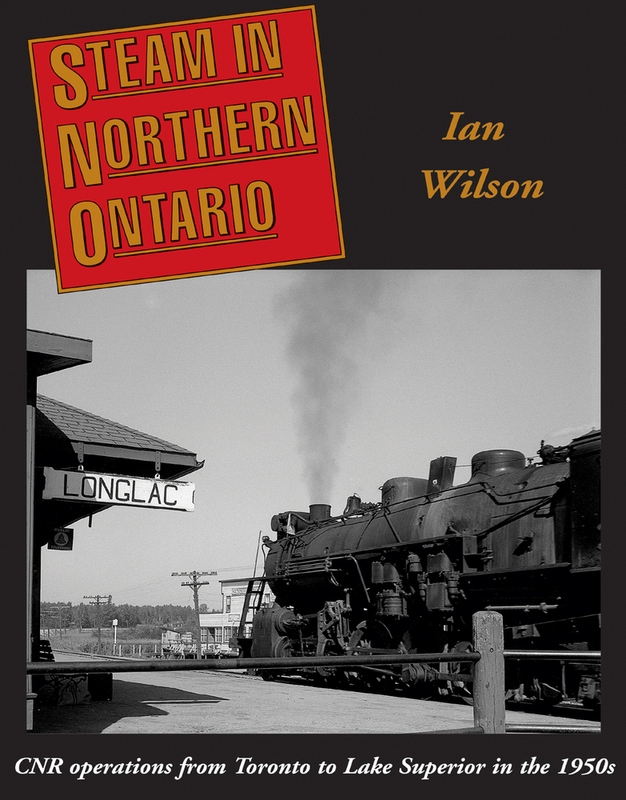 What territory does Steam in Northern Ontario and its companion volume cover? The books document operations on the CNR Northern Ontario District mainline from the Don Valley in Toronto to the Lake Superior region. Behold Mikados and F-units hauling manifest freight through remote territory patrolled by school cars. Watch bullet-nosed Mountains with the solid green heavyweight cars of the Continental wend their way across a landscape of lakes, streams and evergreens as far as the eye can see. Explore the switching operations of Consolidations handling pulpwood, lumber, coal and paper against a backdrop of log booms and pulp and paper mills between Longlac and Port Arthur. Travel behind a Pacific aboard an all-night local passenger train, an express extra or a weekly mixed. Observe the connections with the Ontario Northland at North Bay and the Algoma Central at Oba. From section houses and water tanks at remote sidings to the coal docks, roundhouses, icing platforms and division point stations at South Parry, Capreol, Foleyet, Hornepayne, Jellicoe, Nakina and Armstrong, this is single track mainline operation at its finest.